Today is a crock pot kind of day here in Washington, the snow is coming down and not expected to stop. So I was thinking about making something warm and yummy in the crock pot and I stumbled across this, it's not free or cheap but I thought it was kind of fun. 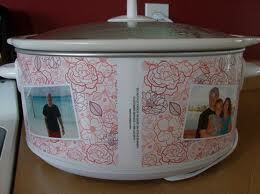 For only $49.99 you can customize your crockpot with family pictures and a cool design, I don't know if I would want to spend $49.99 on a crock pot but it would be a fun gift for Grandma or Mom or anybody who enjoys crock pot cooking. 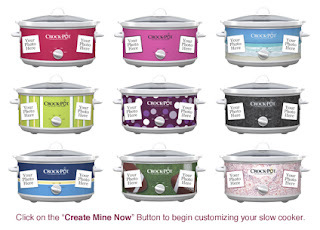 Here's one that has been customized courtesy of http://www.365daysofcrockpot.com/ this site has a ton of crock pot recipes!